Volunteer helpers are now on hand at the entrance of Pilgrim Hospital, Boston, to guide patients and visitors around the wards and departments. 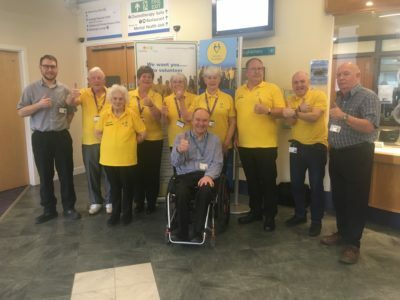 A new permanent volunteer station is now situated next to the hospital’s main reception and staffed by a team of helpful volunteers, five days-a-week. It’s the first time Pilgrim has had a dedicated team of ‘meet and greeters’, after the introduction of an initial troop at Lincoln County Hospital last year. Voluntary Services Manager at United Lincolnshire Hospitals NHS Trust (ULHT), Andrew Tysoe, said he is now looking out for more volunteers to join the service. “Ideally, we are aiming to recruit up to 25 more volunteers to work in pairs for half day shifts from Monday to Friday,” said Andrew. Volunteer of the Year Nigel Brasier, who decided to launch the initiative as part of a Trust wide quality improvement programme. Nigel, who has been volunteering at Pilgrim for two-and-a-half years said: “It’s great to see this project finally come together. I have been working on it with the quality improvement team for several months now and thank everyone who has supported it from start to finish. “The meet and greet station will certainly help both patients and visitors find their way around the hospital. I love my volunteering role very much and get to meet some amazing people. Volunteer and singer Elaine Huckle, who released a CD last year to help raise funds for ULHT charities and Nordoff Robbins, said she enjoys giving up her spare time to help others. “I love volunteering, it’s such a privilege,” said Elaine. “To be able to help the staff and patients in any small way really does make a difference. If you have some spare time on your hands and would like to help out at Pilgrim hospital, please contact ULHT voluntary services on 01522 597838, email voluntaryservices@ulh.nhs.uk or visit the ULHT website. Alternatively you can contact Nigel Brasier at Pilgrim hospital direct on 01205 446873.